Why should I invest in SMARTech System? SMARTech systems use the official European installation standard – KNX. This standard replaces conventional electrics and will soon be a standard in modern homes and buildings. KNX devices are manufactured by big European companies like ABB, BERKER, BOSCH, GIRA, HAGER, JUNG, MERTEN, MOELLER and SIEMENS. A house equipped with an intelligent installation is more comfortable, secure, economical, and has a greater value for future buyers. How much does a SMARTech System cost? A simple system controlling the lighting, heating and roller blinds costs an average 30% more than a conventional (non-integrated) one. However, should it also integrate more complex functions, it can be in effect a lot cheaper then several separate traditional systems. What to do to have an intelligent house in the future in case one cannot afford it now? In the case of limited financial resources, we recommend designing the project that could be in the future adapted and upgraded with a SMARTech system. 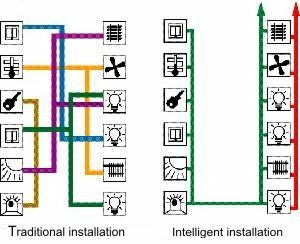 Then you will have a way to adapt the installation to an intelligent one (even in several years, when the System becomes commonplace). The cost of such a design is only a little greater than a purely traditional installation. Thanks to this you will have the possibility of creating an intelligent house step by step (function by function or room by room), without the necessity of a troublesome modification of the house. How in practice is a system by SMARTech designed and implemented? 1. The customer discusses his needs with a SMARTech consultant. 2. We design the project based on the investor’s needs. 3. Technicians of the SMARTech Group lay the cables and install all the devices. 4. We program and start up the system, and provide service. The process is described in detail here (now only in Polish). Just contact us. Our experts have several years of experience with X10, KNX (control via a low-voltage 249 bus), KNX Powernet (control via the 230V mains) and KNX RadioBus (radio waves) systems.